Welcome back to Pingsunday Table Tennis Blog. 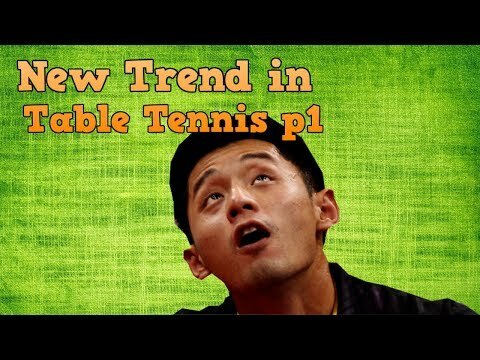 Today, let’s learn the “New Trend in Table Tennis” series. This will help you understand the tendency of the development in table tennis. This is the part 1 of the series. I want to talk about 3 players which are affected a lot by the “New Trend of Table Tennis”. What is a new trend in table tennis? Well, this trend is not new. But since 2 years ago, in 2016, people were talking about the new Plastic ball. With this new ball, players and coaches had to adapt, and had to found a new way to win more! One of the best 40+ balls is DHS 3 star balls (check price/ read review). So the new ball has less spin. To have the same amount of spin, players need to hit harder, and faster. And because it has less spin, the ball will bounce higher. So now, the player can hit the ball sooner! So what is the new trend? Before 2016, players win the rally by the quality of the shots (power, spin, and speed). But with the new ball, it’s much harder to win by spin. And the most important change is the timing. The first bounce is now higher, so it gives the player a fraction of second more time. So the player can now hit the ball sooner. This little fraction of second is crucial. It changes the table tennis nowadays. Less spin, bounce higher, and slower on the first bounce make the player need to be aggressive on the return. Top players will hit the ball sooner, to gain speed. The shot is also less affected by the spin, that’s why players can hit into the ball off the bounce. Top Chinese players must also adapt to the new ball. Chinese coaching staff has adjusted the techniques of the players. Xu Xin, Ma Long lost some games, but finally adapted to the new trend. So how about Zhang Jike? He is the king of the old 40 celluloid ball. He is well-known for his physical strength, “explosiveness power”, and optimal timing. His shots are high quality (loaded of spin, and speed). That’s why Zhang Jike tends to hit the ball at the same timing. He wants to gain the quality (spin) of his shots. But with the new ball, Chinese coach asked him to adjust his technique. Hit the ball sooner, and finish the point faster! And he has changed his technique, mostly on the forehand side. But he relied too much on the “explosiveness”, so he is prone often to injury. Recently, he tries to come back to play to the Hong Kong Open 2018. There are the lost points of Zhang Jike. You can see that the rally now will last longer with the new ball. And Zhang Jike cannot finish the point sooner. He tends to hit the ball too late, compared to the new trend. His timing is not optimal. Each time, he tried to finish the point, by hitting harder he made the error (because the ball has less spin, so less consistent). With the bigger and thicker ball, to have the same quality, players need to have more physical power. 1) His playing style is out-dated (with the new ball). 2) He needs to share between: Love (with his new girlfriend), Media Performance (his business), and Professional table tennis player. So maintaining the world class top level as an athlete is harder for him. 3) His physical is not at top shape anymore. Age, injury has made his game less effective. His games relied on his physical strength to win. This is the interview with Zhang Jike, about his performance at the Hong Kong Open 2018. He lost to Yoshimura at Round 32. That’s it for today. Next series, I will talk about Miu Hirano and Tomokazu. And also what to do to adapt to the new trend of table tennis. Have you prepared for this trend? Zhang Jike was the king of the old ball. With the new ball, will he retire soon? or he will make a strong come back? I think, Zhang Jike’s big time is over. Apart from his physical susceptibility, he probably lacks the ultimate ambition. It would be best for him to stop and devote himself to his new life – girl friend, popularity, money: What more do you want? Ultimately, but no wonder with someone like him who has won everything. His epic duels with Ma Long will still be remembered for a long time. Большой спорт не бесконечен,самое главное во время уйти. Он все сделал для своей страны у него есть все титулы.Он великий спортсмен! Здоровья и удачи ему! Он великий спортсмен! На протяжении многих лет выступал за свою страну и имеет все титулы которые есть в настольном теннисе.Здоровья и удачи!